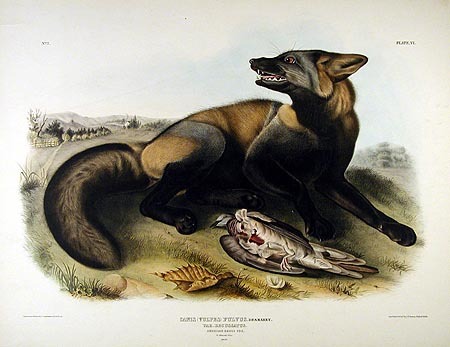 This depiction of a cross fox comes from The Viviparous Quadrupeds of North America by John Bachman and John James Audubon. The cross fox is a color phase of the red fox, which is found almost exclusively in the North American populations. In fact, I’ve never heard of a European cross fox, but if they exist, I’ve not heard of them. Contrary to what you might think of an animal with a name like “cross fox,” this animal is not a hybrid animal. It is a lesser known color phase of the red foxes (Vulpes vulpes). It is called a cross fox because it has a band of dark hair running down its back and another band running accross its shoulders. In the biblical sense, this forms a cross. As far as I know this color variation appears only in North America. In my region, the most common color phase of this species is the typical red. There are a few cross foxes around, but next to zero melanistic foxes. Melanistic foxes with white hairs mixed are called silvers, but virtually none of these exist in my part of the world, except in captive fur-bearing population. Now, contrary to popular belief, red foxes cannot hybridize with gray foxes. Reds can breed with silvers, because they are the same species. The gray fox (Urocyon cinereoargenteus) that ranges from southern Canada to Colombia and Venezuela is a very unusual animal. The genus Urocyon consists of the gray fox and the island fox of the Channel Islands of Southern California. This genus is sometimes considered the most primitive of all dogs, for both of these species retain the ability to climb trees. Indeed, they are very good climbers, almost as good at arboreal locomotion as any cat. The cross fox is just an interesting coloration of the red fox. It is not a separate species or a hybrid. Unlike the gray fox, the red fox is not native to most of the Eastern US. Studies of that population confirm that this particular subspecies is almost identical to the red fox of Britain. This finding makes sense, considering that we have records of introductions from Europe during the eighteenth century. Now, it’s very interesting that the red fox comes in some many colors. A wide range of coloration matches the varied habitat of this species. Currently, it is the most widespread of all wild carnivores. It is found throughout Eurasia (including Japan), most of North America, and North Africa. It has been introduced to Australia, where it is has proven to be a terrible introduced species, killing off lots of small marsupials and ground nesting birds.